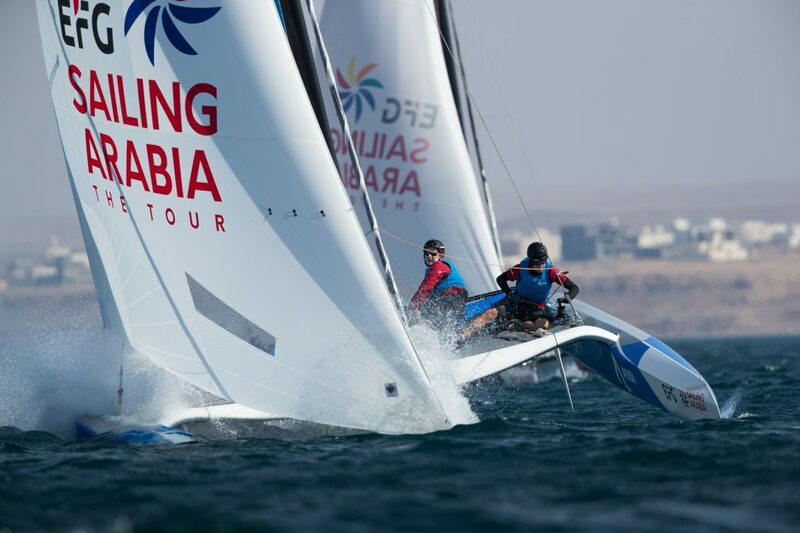 British two-time Olympian Stevie Morrison made amends for missing out on the top spot in yesterday’s EFG Sailing Arabia – The Tour coastal raid by leading his Averda team to victory in the penultimate round of stadium racing in Sur. 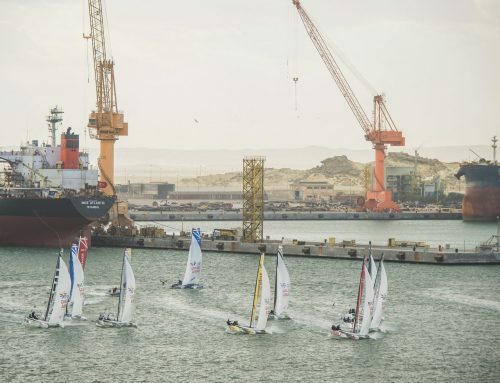 After 11 days of thrilling racing at four stunning locations in Oman, and with just two days of the regatta remaining, the teams’ eagerness to win points was evident. Beijaflore and all-woman crew DB Schenker were the only teams not to be disqualified at some point over the six races for being over the starting line when the gun fired. Vivacar and Renaissance picked up two disqualifications each for pulling the trigger too soon on the startline. 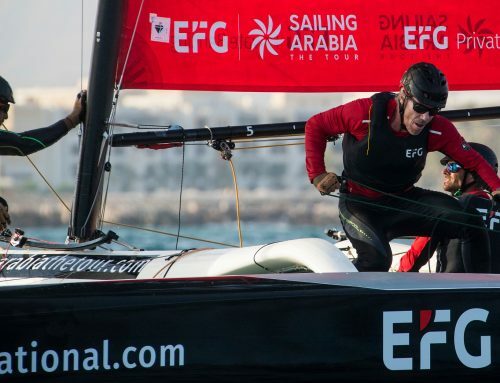 It was the also the first day since the beginning of EFG Sailing Arabia – The Tour on February 3 that neither Beijaflore nor second-placed EFG Bank Monaco, the reigning champions, won a race. Beijaflore command a ten-point lead overall going into the final stage of EFG Sailing Arabia – The Tour, with just two points splitting EFG Bank Monaco and Averda in second and third. Morrison, whose crew consists of renowned British tactician Nic Asher and Omani sailing star Abdulrahman Al Mashari, said beating EFG Bank Monaco was their goal. “We felt we let one go yesterday – we ended up second when we should have won – so we were pretty focused on winning going into today,” he said. “We had cracking breeze and the sailing was great fun. We sailed well and dominated early. We felt we were the best team out there and when we got the opportunity to prove it we did. 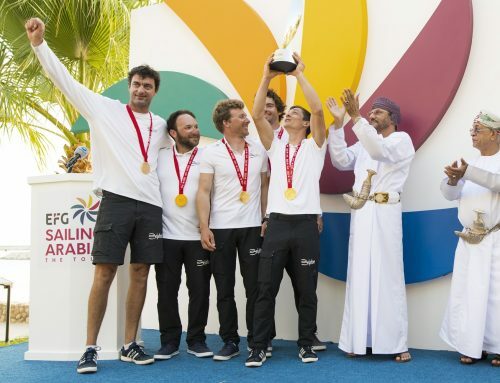 Thierry Douillard, skipper of four-time EFG Sailing Arabia – The Tour winners EFG Bank Monaco, said he was content to finish behind Averda, made up of team mates from the Oman Sail squad that will take on the Tour Voile in France this summer. 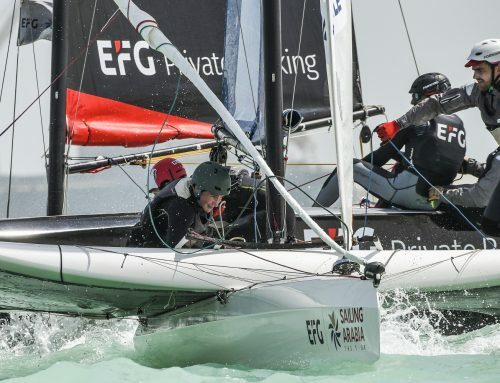 The finale of EFG Sailing Arabia – The Tour will consist of a coastal raid from Bandar Al Rowdha to Muscat’s beatiful old town of Muttrah on February 16, followed by a day of stadium racing there the following day. 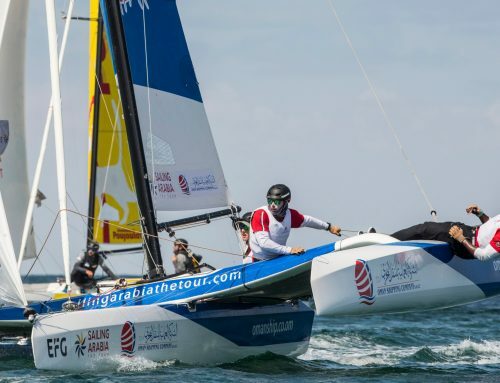 The 2018 EFG Sailing Arabia – The Tour winners will be crowned at a prize giving ceremony at Muscat’s National Museum of Oman on the evening of February 17 attended by gust of honour His Excellency Sayyid Saud Bin Hilal Bin Hamad Al Busaidi, Minister of State and Governor of Muscat.